Uses thermostatic technology to keep the temperature safe and stable for all the family. It will keep the temperature to within 2 degrees C of your chosen selection, no matter who is also using the water supply in your home. Flexibility with separate flow and numbered temperature dials for your ideal shower. A striking polished chrome fascia. An integrated pump delivers up to 14 litres of water per minute at the maximum flow setting. Extra safety is included with an automatic shutdown feature. This will shut down the shower if the hot or cold water supplies fail, removing the risk of overheating or scalding. 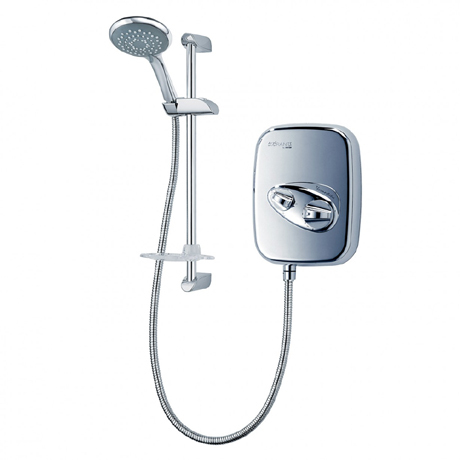 An adjustable maximum temperature keeps the shower safe for all the family. Great shower at a very reasonable price. Lovely sleek modern look & great value for money. "I wanted a like for like shower but in Chrome only thing different is the on/off button is a knob you turn instead, instructions easy to follow and easy to install. Lovely shower and looks perfect in my bathroom as everything now matches. Happy Customer." Look extremely stylish and very efficient. Great power shower and lovely looking in the shiny chrome. "The product is excellent both in appearance and performance. Friends who have seen my new bathroom have made particular comment on the shower, So nice to see chrome instead of the usual white."